Millions of people suffer from chronic pain, without being aware that one of its main causes can be stress. Latest studies show that people who struggle with anxiety and stress constrict their muscles, which causes fatigue and cramps, headaches and IBS. Stress is a natural physical and mental reaction to life experiences, and we all feel it from time to time, due to everyday responsibilities like work and family to serious life events like a new diagnosis, war, or the death of a loved one. Stress can be beneficial for immediate, short-term situations, as it helps one to cope with potentially serious situations, by releasing hormones that increase heart and breathing rates and prepare the muscles to respond. However, chronic stress keeps the stress levels elevated, and this can take a toll on your health, causing various symptoms and affecting overall well-being. The muscles tense up to protect themselves from injury when stressed, and when one relaxes, they release again. 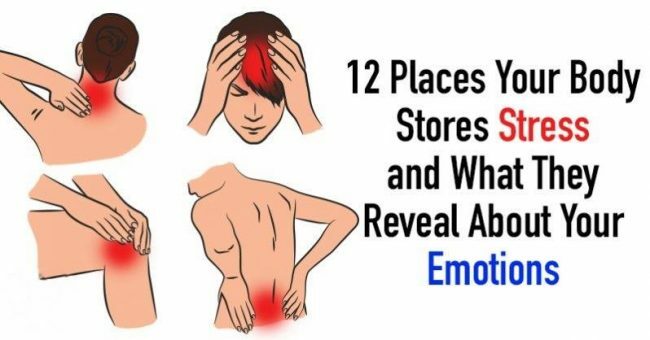 Yet, they do not get the chance to relax in the case of chronic stress, and their tightness causes back and shoulder pain, headaches, and body aches. Moreover, Dr. Susanne Babel claims that studies have shown that the chronic pain can not only be triggered from physical injuries but it is also a result of emotional issues and stress. Often, physical pain is only a sign our body sends that there is still some emotional work left that must be done. Headaches are often a result of worrying about small things in life, and certain obstacles you face. Find a way to relax and not think about your everyday tasks and problems. The pain in the neck is often linked to resentment or a grudge against you or others. Sometimes, it is too difficult to forgive, but find the strength to let go, in order to improve your own wellbeing. You are probably indecisive, and the dilemma you face causes intense pressure. Find a person you can talk to, and even ask for advice, and you will find a solution easier. In most cases, this pain is caused by the fear of love or a feeling of being unappreciated. Yet, communication is the best way to ask for support from your loved ones. Pain in the lower back can be caused by the fear of loss or obsession with money. Remember, wealth is not the key to happiness, so try to find love and joy, and the profits will eventually come. Joint pain can be a result of illogical stubbornness. Try to let things happen in life, and do not resist to changes. Pain in the hands is caused by loneliness. Try to go out more, meet new people, spend time in crowded places, and catch up with friends. People who are afraid of change often develop hip pain. Life changes and you should go with the flow. Enjoy every single moment of it, since it can be a great adventure. People with an inflated ego develop knee pain. Take a look at the world — it does not revolve around you. Show care for your loved ones, and be there when they need you. Pain in the calves might indicate tension in the relationship, possessiveness, and jealousy. Learn to trust your friends and partner, relax and do not opt to control people. On the other hand, if someone forces you to lose yourself, it is time to move on alone. Our busy and hectic lifestyles often force us to neglect our needs and stop chasing our dreams. Yet, you need to take proper care of yourself and do things that make you happy and help you accomplish your goals in life. The pain in the feet usually appears in the case of apathy, or when someone believes that everything is going wrong. Just take your time and find beauty in your life. Smile more, do fun things, and enjoy life to the fullest.